Removing ceiling texture in the living room of a condo at 1723 Alberni St. Removing ceiling texture is something we at RemoveCeilingTexture.com take pride in. Textured ceilings, popcorn ceilings, stipple ceilings…whatever you want to call them, we despise them. It gives us pleasure to take a home that has dated texture and turn it into something modern, bright and airy. There’s nothing better than the look on the homeowner’s face when they see the ceilings at the end of the project. They often haven’t realized how much the popcorn ceilings have affected the feel of the home, but once it’s gone, the ceilings look higher and the whole space becomes brighter. Why Do Popcorn Ceilings Exist? It’s one of the great questions of our time. Second only to the meaning of life, of course. Putting a popcorn-like texture on the ceilings is pretty absurd if you think about it. Where else in your home has a thick, ugly texture been sprayed? Do your kitchen cabinets have texture? What about your floors? Ceiling texture is popular with developers because it’s much easier and faster to spray the ceilings than it is to finish the drywall (or concrete if you’re in a highrise). And ceilings are a difficult area to work on because they’re above your head and out of reach from the floor. This means it takes more time and effort to create a nice, smooth ceiling. Unless they’re building a custom home, or build high-end homes, developers usually want to get the house built as quickly as possible. The faster they can get the house sold, the quicker they can see a profit. Popcorn ceilings are a way to cut corners a bit. Some people argue that ceiling texture stops echoes, but as we wrote in a previous post, The Lowdown on Textured Ceilings, it’s not the popcorn that is absorbing the sound in a room and thus stopping echoes, it’s your furnishings. If you have a completely empty room with popcorn ceilings, there will still be an echo. After removing ceiling texture on many homes, we’ve yet to have anyone complain about echoes. It’s not just that popcorn ceilings are aesthetically offensive, although that’s reason enough to want them removed. They can be detrimental to your health. Popcorn ceilings are known to aggravate asthma and allergies. This is because they trap dust, which can later fall back down, making your eyes itchy and your nose runny. If you or a loved one has asthma, popcorn ceilings can be quite dangerous. A homeowner in North Vancouver contacted us about removing ceiling texture because her grandson was allergic to dust and she was concerned that her ceilings could be making his symptoms worse. She was thrilled with her ceilings after we worked on them. They are now smooth and dust-free. We were recently contacted by a homeowner on Alberni Street in Vancouver. She was concerned about germs and dust that could become trapped in the popcorn ceilings, plus she hated that her condo looked like it was stuck in the 1970s. She decided to remove the texture herself. When she was done the bedroom, she was not impressed with her work. The ceilings were rough and uneven, but she figured that’s as good as they were going to get and she would just have to live with them. Then she found RemoveCeilingTexture.com. When she realized that there is a company in the Lower Mainland that specializes in removing ceiling texture and resurfacing ceilings, she was thrilled. She decided to have us do the rest of her condo. Since it had taken her a long time to scrape her bedroom ceiling, she figured we would be there all week working on her ceilings. When we told her that we should be able to finish within 3-4 days, she was so excited. Her ceilings were straightforward and everything went as planned. We were done within 4 days and she was very pleased with the results. If you’re tired of your home looking outdated or are concerned about the health risks that popcorn ceilings pose, removing ceiling texture could be just what is needed. Contact us today for a FREE quote. Give us a call at 604-420-7578 or contact us through email. Contact RemoveCeilingTexture.com today for a FREE quote on removing ceiling texture! 1. Arm yourself with a scraper and determination. 3. Go buy a new ladder. And several other things that catch your eye at Costco. 4. Set up the new ladder in the bedroom. Remove the popcorn. Easy. 5. Realize the layers of paint on the ceiling do not make for easy scraping. Use some elbow grease. 6. Curse at the hole you’ve gouged in the drywall by using elbow grease. 7. Look at the small patch you’ve managed to scrape off so far. Look at the rest of the room ahead of you and think of the other bedrooms, dining room, living room and hallway still waiting. Sigh. 8. Climb down the ladder and shake off all the popcorn and dust from your hair and clothes. Wonder if the dust is hazardous. 9. Sit down at computer and Google “is popcorn ceiling dust dangerous”. Hide screen from your wife as you see the word ASBESTOS. 10. Find out that your house is not old enough to have asbestos. Phew. 11. Check email, Facebook & Twitter. Find out if the ladder you bought is cheaper anywhere else. 13. March back to the bedroom. Try to ignore Rover’s sad puppy dog eyes and the leash in his mouth. Fail. Call for your wife to take Rover for a walk. Remember she has taken your daughter to a piano lesson. 14. Be pulled along by Rover as he sniffs every bush and pees on every post. Realize, too late, that you forgot to bring a plastic bag. S#*t.
15. Revived from the fresh air, continue your work in the bedroom. Climb up and down the ladder multiple times as you move it foot by foot around the 200 square foot room. 16. Greet your wife and daughter as they walk in the door. Wonder why their mouths are dropped open in horror. Look down from your perch on the ladder at the popcorn-strewn floor around you. Comfort them with the fact that at least it doesn’t have asbestos. 17. Vacuum the popcorn-ceiling-dust trail that Rover has tracked all over the house. 18. Eat dinner. Resolve that you will continue working after dinner. 19. Decide to catch a bit of the game before continuing. 20. Decide it’s too late to continue with the ceiling tonight. Continue to watch TV instead. 21. Calmly answer your wife’s questions about the scrape marks and gouges in the bedroom ceiling. 23. Start removing popcorn ceiling in hallway. 24. Remember you have to renew your car insurance before it runs out tomorrow. Go renew insurance. 25. Start removing popcorn ceiling in hallway, until your wife suggests maybe the living room should be next. 26. Start removing popcorn ceiling in the living room. 27. Realize that starting this project may have been a mistake. 28. Have an early lunch because you have to go coach your daughter’s soccer team. 29. Notice that your garage s pretty messy and spend several hours sorting through junk. 31. Continue working on the living room ceiling until Game of Thrones comes on. Monday – Friday: You’re too tired after work to contemplate working on the ceilings. Saturday – Sunday: This weekend is your daughter’s soccer tournament. Is Your Time Worth Nothing? The above timeline may be a bit of an exaggeration, but the point is, you have other responsibilities in your life besides removing popcorn ceilings. When you’re working on your own home, there are dozens of things to distract you. You may think, “But I’ll save money doing it myself!” That’s only true if you value your own time at zero, because as the saying goes, time is money. Also, no matter what the online guides say about how to remove popcorn ceilings, it’s not easy work. It doesn’t always scrape off easily, and you could damage the drywall beneath. Another thing these guides don’t usually mention is that scraping the texture off is only the first step to getting smooth ceilings. Your ceilings will still need to be resurfaced before you can think about painting them, or they will look rough. It’s usually fairly easy to spot a DIY texture removal–they just don’t look quite finished. At RemoveCeilingTexture.com we cringe when we see the How to Remove Popcorn Ceilings guides online because we know that as with many DIY projects, it often turns into a headache and the end result is not ideal. We get a lot of calls to fix ceilings that were a failed DIY attempt at ceiling texture removal. As professional ceiling experts, our only responsibility is to work on your ceilings. We’re not distracted by taking dogs for walks, mowing the lawn, renewing the insurance, soccer games, etc., etc. We also have the tools necessary to get the job done. We have a special machine that takes off the texture and then we resurface the ceilings using a method that has been used for centuries by master artisans. The hawk and trowel. This method takes years of experience to master. Our experience and specialization in ceiling texture removal is what makes us unique. What may take you weeks to finish, we can accomplish in several days. Our end result is professionally finished, smooth ceilings. Your time is valuable so why waste it with a trial and error attempt at removing popcorn texture? To get a free quote for removing popcorn ceilings, give us a call at 604-420-7578 or contact us by email. Also, take a look at some of our other before and after photos to see how ceiling texture removal can transform a room. Find out more about popcorn ceiling removal done the professional way. Contact us today for a FREE quote! Textured Ceiling Removal: Before and after of kitchen at Windward Dr. Many companies offer various types of textured ceiling removal. A drywaller might tell you he can cover your texture with new drywall. A guy with a handyman service may tell you he can easily scrape off the popcorn. You may even have a neighbour who swears his sister-in-law’s brother’s cousin used some ‘magical’ product to remove his popcorn ceilings and he can probably ‘score’ some for you too. He might then ask if you have anything to munch on. The problem with these solutions is that they are half solutions at best. None of these people are experts in ceilings or textured ceiling removal. Covering your texture with drywall is unnecessary and leaves your ceilings at least 1/2″ lower. Not to mention you’d have to remove any crown moulding to install the drywall on top of the ceiling texture. Scraping off popcorn ceilings is not easy and is very messy. Hopefully this handyman is aware of the possibility of asbestos in ceiling texture. Even if you did go the route of having it scraped off, your ceilings are going to look pretty awful. That’s because under the texture, they’re not finished. That’s the beauty of ceiling texture for builders. The texture covers many ceiling flaws. Once the texture is gone, the flaws will become apparent. The other problem with dealing with unqualified people, is that the price they give you may not turn out to be the final price. Sometimes it’s an innocent mistake–ceilings are difficult to work on and they didn’t realize how much work it would be, so they have to charge more. Even if it’s innocent, it’s still not fair to you. Other times it can be less innocent, with verbal quotes that are very low just to get you to hire them. Sometimes they won’t even come out to have a look at the ceilings. If they won’t come out to look at your ceilings, that’s a red flag. At RemoveCeilingTexture.com, we won’t give you a firm quote until we see the ceilings. And once we do give you a firm quote, it’s in writing and we won’t charge unexpected fees on top of it. Textured Ceiling Removal: Before and after of entrance at Windward Dr.
Textured Ceiling Removal: Before and after of dining room at Windward Dr.
We were contacted by homeowners on Windward Drive in Coquitlam who wanted textured ceiling removal. We came out to look at the ceilings and take some measurements. We then sent them a written quote, through email. They contacted us to say that someone else had given them a verbal price over the phone that was quite a bit lower, and they offered to paint the ceilings too, for only $100 more. This seemed fairly suspicious to us. The contractors had not viewed their ceilings and yet they promised a very low price. And $100 would barely cover the cost of the paint, let alone the labour to apply it. We told them to be wary of this, and get it in writing. We didn’t hear back from them for a while. When we did, they told us that it turned out that the low price the other company offered did not include everything, and the actual price was going to be similar to the price we quoted. The homeowners decided to go with us because we had been forthright about the price, we were professional, and we are ceiling experts. Textured Ceiling Removal: Before and after of bedroom at Windward Dr. If you’d like smooth ceilings and want to know more about having the texture removed, contact us today for a FREE quote. Call us at 604-420-7578 or contact us by email. Interested in textured ceiling removal? Click here to contact RCT today for a FREE quote! One of our frequently asked questions concerns a dangerous material found in many homes built prior to the mid-1980s. No, not shag carpeting (although that’s scary too). It’s asbestos in popcorn ceilings. Many people have heard it’s bad, but they don’t really know what asbestos is or what can be done about it. Asbestos is a type of mineral fibre. It is naturally occurring and is obtained from the earth by mining. One of the biggest mines is in the town of Asbestos, Quebec. Asbestos has been used in various products for thousands of years, however modern usage began around 1880. There are several types of asbestos, but since this article deals with ceilings, we’ll refer to the one that is most commonly found in ceiling texture: chrysotile. It’s sometimes known as serpentine asbestos or white asbestos. Asbestos was thought to be a miracle material. It’s resistant to chemical and biological degradation, so it’s virtually indestructible. It’s even fireproof. You can see how great it seemed, yet this cheap miracle fibre turned out to be a health disaster. Once a link was established between certain cancers and asbestos, Canada banned its use in building materials. This ban took effect in about 1978, but existing stock was allowed to be used. Because of this, homes built into the early 1980s could also have asbestos in popcorn ceilings. What Health Complications Can Asbestos Exposure Cause? All types of asbestos cause lung cancer, mesothelioma, cancer of the larynx and ovary, and asbestosis (fibrosis of the lungs). Exposure to asbestos occurs through inhalation of fibres in air in the working environment, ambient air in the vicinity of point sources such as factories handling asbestos, or indoor air in housing and buildings containing friable (crumbly) asbestos materials. Most of these health issues are recorded in people associated with the asbestos mining industry, but for safety, any asbestos exposure should be avoided. How Do I Know if There is Asbestos in My Ceiling Texture? Asbestos fibres are microscopic and the only way to know for sure if your ceiling texture has them is to take a sample to an independent lab for analysis. At RemoveCeilingTexture.com we offer a service to come and take a sample to a third-party lab for analysis. Can I Still Get Smooth Ceilings if the Texture has Asbestos? While the only way to get rid of asbestos is to hire an abatement company, the cost can be prohibitive. If you’d like smooth ceilings but don’t want to go through the expensive process of abatement, RemoveCeilingTexture.com can help. Our process for asbestos ceilings will not disturb the ceiling texture, which is important because you don’t want the asbestos fibres becoming airborne. We apply our compound directly onto the texture to seal in the fibres. You’re left with smooth ceilings. This homeowner in North Vancouver was doing extensive renovations in her basement suite and wanted modern smooth ceilings. The home was built in 1974 and so she had the ceiling texture tested for asbestos. The results came back positive. Asbestos abatement was not in her budget, but she still wanted the ceilings to match the rest of the updates. She got a few quotes from drywall specialists, but in the end decided to go with us at RemoveCeilingTexture.com because we are experts in this field. We applied our compound directly to the texture and soon the ceilings were smooth and matched the new contemporary feel of the suite. If you’d like to find out more about ceiling resurfacing, or would like RemoveCeilingTexture.com to come out to take a sample for asbestos testing, please give us a call at 604-420-7578 or contact us by email. Want to know more about asbestos testing for ceiling texture, or how to get smooth ceilings? Click here to contact us today! Ceiling corner cracks. Cracked corners of the ceilings. Entrances to other portals. Whatever you call them, popcorn-texture cracks in the corners of your ceilings are ugly and should be taken care of. And if they are indeed entrances to other portals, you risk the possibility of Narnia-like creatures invading and eating all the cookies in your cupboard. So there’s that. But aside from thwarting mystical beings, there are practical reasons to get these cracks fixed. To start with, the cracks look terrible. Also, dust and moisture can get in there and create problems, possibly leading to more cracking in the texture. And if that’s not bad enough, just think about insects and spiders setting up shop in there. The ceiling corner cracks have to go if you want peace of mind. Why Do Ceiling Corner Cracks Appear? Ceiling texture often cracks in the corners and around the edges of walls because of the way the drywall was finished. If insufficient amounts of mud are applied to the drywall tape at these critical wall-ceiling meeting points, the tape will eventually become too dry and will start to lift off the drywall. The ceiling texture is lifted with the tape and this creates a crack. If you are experiencing this problem, we can fix it during the process of removing the ceiling texture and resurfacing the ceilings with fresh mud compound. This stops the corners from delaminating and cracking again in the long run. These homeowners weren’t sure what to do about their cracks. They decided to find someone who specializes in ceilings. That’s when they contacted us. At RemoveCeilingTexture.com, we deal with ceilings and ceiling texture each and every day. Our experience makes us qualified in a way that drywallers and general contractors aren’t because they don’t specialize in ceilings. In fact, we’re often contacted by general contractors who know they don’t have the expertise when it comes to ceilings. Because the drywall tape underneath the ceiling texture is the culprit, trying to fix the texture won’t solve the problem. The corners are likely to keep cracking in the future. So the homeowners opted to remove the texture altogether and have the ceiling resurfaced. The mud compound we use will stop the tape from lifting. This fixed the ceiling corner cracks problem, but also gave them modern, smooth ceilings that literally freshen the home. Air quality is better after ceiling texture is removed because dust and other allergens can no longer become trapped up there. Now they don’t have to worry about ceiling cracks, asthma aggravation, or half human-half goat fauns leaving muddy hoof marks in the living room. Ceiling cracks in the living room of a Burnaby condo. If you have ceiling cracks, or you just want more information on removing ceiling texture, contact us today. Call us at 604-420-7578 or contact us by email for a FREE quote. Have ceiling cracks, or want your texture removed? Contact us today! There are several things known to make most people cringe. Looking through old photos from the 80s when hair height was a competitive sport. Seeing the person in front of you at the cashier open up her little change purse. “96 cents? I think I have that in pennies somewhere in here. One, two, oh, woopsie, that one’s not a penny, it’s a lint-covered alka seltzer.” I’m pretty sure this is the reason the penny is now outlawed in Canada. People also cringe when they see textured ceilings when viewing a home to purchase. We get calls all the time from people who have viewed a home but the textured ceilings are turning them off. They want to know if it can be removed before they’ll even think about putting in an offer. Or they’ve already bought the house but they reduced their offer because they knew they would need to have the texture removed. Removing popcorn ceilings is often first on a new homeowner’s list of renovations. We recently encountered a similar situation in Langley. The homeowners had purchased the house a few months earlier and were now starting renovations. First up was removing popcorn ceilings. They called a few people to come out to give them quotes. These were drywallers and jack-of-all-trades handymen. They also called us at RemoveCeilingTexture.com. We were the last to have a look. The first thing we asked was what year the home was built (it was from the 70s) and if the ceiling texture had been tested for asbestos. They told us no, the texture had not been tested and that the other contractors didn’t mention, or even seem to know about the possibility of asbestos in the ceiling. Asbestos is seen in some ceiling texture even into the early 1980s, yet the contractors were willing to just scrape it off because they didn’t know about the danger. If the texture had asbestos, they would be putting the health of the homeowners and their new baby at risk. Not to mention risking their workers’ health. The first thing we suggested was an asbestos test. We can still provide smooth ceilings if there is asbestos, however, it turned out that their texture did not have asbestos, so we would not need to take extra precautions. There are several problems with hiring people who are not ceiling experts. At best, you could end up with a sub-par ceiling. At worst, however, your health could be compromised. Removing popcorn ceilings, and other types of ceiling texture, is something we do every day. Another problem is that they may quote you a low price, sometimes even sight-unseen. After the work is done, the real price often becomes apparent. Extra charges are sometimes added to the bill. At RemoveCeilingTexture.com, we’ll come out to have a look, at no cost to you, to make sure we know exactly what the job will entail. That way, when we give you a quote, that’s the amount you’ll pay, with no hidden fees or extra charges. The homeowners in Langley made the right choice and hired us to give them smooth ceilings. They were very happy with the results. If you’re wondering about removing popcorn ceilings, or other types of ceiling texture, give us a call today at 604-420-7578 or contact us by email to find out how you can get smooth ceilings. We don’t charge to come out and have a look, and our quotes are always obligation free. Thinking about removing popcorn ceilings? Contact us today for a FREE quote! If your home was built from about 1950 onwards, there’s a good chance you have textured ceilings, also known as popcorn ceilings or stippled ceilings. It’s even being used today in the countless highrises sprouting from the earth like fungi. You might think, wouldn’t they be able to sell the units for more money if the ceilings were smooth and actually looked finished? Yes, they most likely would, but the problem is that old adage: time is money. Textured ceilings are quick and cheap and they need to sell the units as quickly as possible. This keeps us at RemoveCeilingTexture.com quite busy. So let’s break it down. What are the arguments for and against textured ceilings? This argument really only works for the developer. But this is about you, the homeowner. texture. Do you know what else is quick and cheap? Leaving the concrete floors unfinished and not painting the walls. How many developers do that? For some reason textured ceilings have become almost an industry standard and people put up with it. If you live in a modern condo building, the texture is not making a difference in sound transmission. Generally, you shouldn’t be able to hear your neighbours walking around. However, if your upstairs neighbour insists on channeling her inner Victoria Beckham by walking in heels at all hours, textured ceilings will not make one iota of difference. You’re going to hear that clickety-clack whether or not you have textured ceilings. Likewise, the creaks and groans of an older home are going to come through regardless of the texture on your ceilings. The sound may not even be coming through the ceilings. If walls are missing insulation, sound will travel through. Unless you have a seriously sound proofed room that can silence a nine-year old boy and his drum set, you’re going to get some sound transfer. The other sound issue people talk about is echo within a room. Removal of textured ceilings in the dining room of a Vancouver Condo – 1230 Haro St. Echoes occur when sound waves bounce off of hard surfaces such as walls and ceilings, multiple times. It’s true, if you have an empty room with no furniture, textured ceilings will slightly dampen echoes. But once you add softer components such as sofas, chairs, beds, carpets, rugs, etc., the sound waves will be absorbed by these softer items and won’t create an echo. So your textured ceilings are not helping. Are you sure about that? They may not bother you visually, but what they harbour could be affecting your health. Asthma, allergies and other respiratory problems can be aggravated by the dust and allergens that are present in every home. In most homes you vacuum, you dust…problem solved, right? Not so fast. The dust gets stuck in the nooks and crannies of textured ceilings. It can then fall back down at its leisure, making your symptoms worse. Smooth ceilings appear higher – Vancouver condo at 1331 Homer St.
Resurfaced concrete ceilings at a Vancouver condo – Bedroom at 1331 Homer St. The good news is that you’re not stuck with textured ceilings. From penthouse condos to heritage homes and everything in between, we can provide smooth ceilings for pretty much every type of dwelling (we’ve yet to do a hobbit-hole, though). At RemoveCeilingTexture.com, our name only tells part of the story. Removing the ceiling texture is only the first step to smooth ceilings. Once the texture is gone, you’ll often see inconsistencies in the ceilings. If you were to paint at this stage, they wouldn’t look very good. The next, crucial step is where our expertise really shines: resurfacing the ceilings. Our process will leave you with flawless, smooth ceilings that look fantastic. Contact us today for a FREE QUOTE for getting rid of your textured ceilings. Send us an email, or call us at 604-420-7578. Tired of your textured ceilings? Contact us today for a FREE quote! Ceiling finishes are pretty much only limited to your imagination. From Michelangelo-esque works of art to wallpaper to coffered ceilings, the one thing required before beginning is a flat surface. Popcorn ceiling texture gets in the way of most ceiling finishes. At RemoveCeilingTexture.com, we specialize in not only removing the texture, but more importantly, in creating sleek, blemish-free surfaces. They are beautiful left this way, or use them as a base to apply mouldings, medallions or stencils to get the look you want. Sashimi, Steak Tartare, Egg Nog: Must Our Concrete be Raw Too? If you live in a highrise building, you likely have concrete ceilings. Designers of these buildings use various concrete ceiling finishes to achieve whatever look they’re going for. Sometimes they’re left bare for a raw, industrial look. This look isn’t for everyone. While it may look glamourous in magazines or movies, in real life it can feel cold, impersonal and just plain unfinished. Other times the concrete’s sprayed with ceiling texture just like drywall ceilings are. Why? It’s cheaper to spray popcorn texture than it is to finish them to a nice smooth surface. If you have over 100 condos in a building to finish, speed usually triumphs over quality. RemoveCeilingTexture.com can remove the texture, fix any cracks and holes and skim over the concrete to create a warmer, finished look. Contact RemoveCeilingTexture.com today for a FREE, no obligation, quote for ceiling texture removal. Send us an email, or give us a call at 604-420-7578. We’d love to discuss your project and answer any ceiling related questions you may have. Contact us today for a FREE quote on ceiling texture removal! You know the saying, popcorn doesn’t grow on trees? Oh, that’s not the saying? Well, it doesn’t grow on trees. And it shouldn’t grow on ceilings either. Popcorn ceilings is another term for textured ceilings. I guess they started calling it popcorn ceilings because warty ceilings just doesn’t have the same ring to it, does it? *On a side note, I did a Google image search for warts when writing this post. Do not do that. Ever. Whether you call it popcorn ceilings, textured ceilings, stippled ceilings, or what it really looks like, diseased ceilings, you can have it removed. RemoveCeilingTexture.com specializes in popcorn ceiling removal. So Popcorn Ceilings Look Bad, What’s the Big Deal? Apart from the fact that they’re hideous to look at, popcorn ceilings are harmful to your health. Since they are next to impossible to clean, dust gets trapped up there. Do you know what dust is composed of? It’s a mixture of many things, including plant pollen, hair, and skin cells. Yes, all those things are trapped up in your popcorn ceiling. If you or a family member has allergies, you’ll benefit from smooth ceilings. Even if you don’t have respiratory problems, I think we can all agree that when it comes to breathing in skin cells, less is better. Now that you’re completely grossed out over popcorn ceilings, how can you have them removed? At RemoveCeilingTexture.com, we’re experts in creating smooth ceilings. But it’s not as easy as simply scraping the popcorn off. There are a few steps involved. First the popcorn is removed with a special machine to minimize any mess. After this step, the ceilings look rough and unfinished. The second step, ceiling resurfacing, is where the real magic comes in. This is where we even out any dips, waves, or other blemishes apparent when the popcorn comes off. The last step is a quick sanding to make the ceiling flawless. Read more about RemoveCeilingTexture.com’s unique process. If you’re like us, you believe that popcorn belongs at the movies, not stuck to your ceilings. 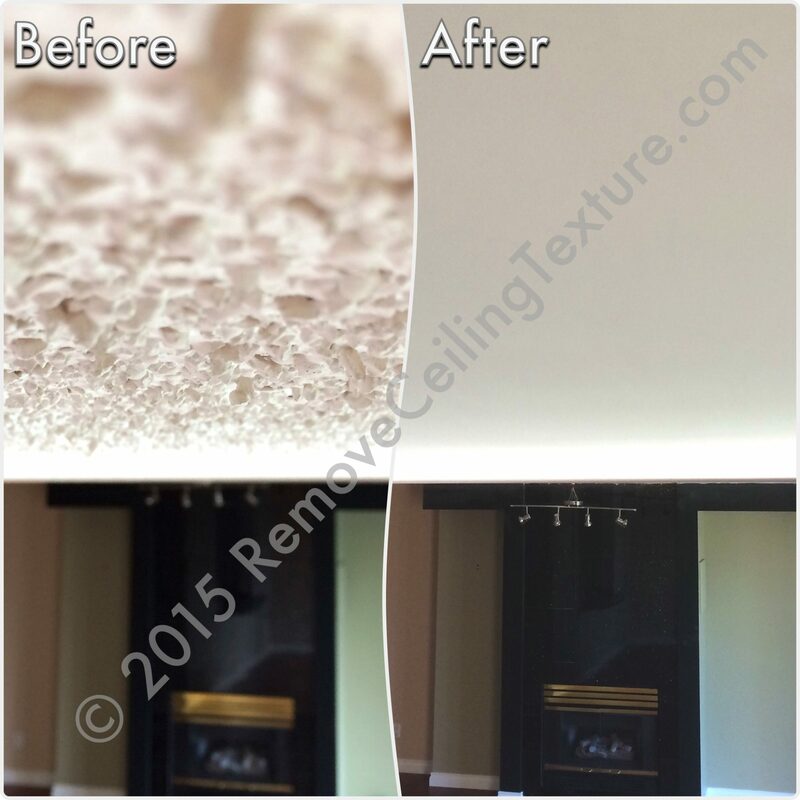 Contact RemoveCeilingTexture.com today for a quote on popcorn ceiling removal. Unlike some companies, we don’t charge for providing a quote and our quotes are always obligation free. So send us an email, or give us a call at 604-420-7578. Get a FREE quote on popcorn ceiling removal! Whitney Houston said it best: Crack is whack. Okay, so she may not have been talking about ceiling cracks, but the sentiment still applies. Ceiling cracks can be a natural part of a home settling, or they can be a sign of a bigger problem. If the crack is larger than 1/4” in width, there is sagging in combination with the crack, or the crack continues from the ceiling down the wall, you may want to have a structural engineer come in to assess the problem. Other cracks, known as hairline or spiderweb cracks, are usually superficial in nature and can be fixed by a ceiling professional. So what causes these little cracks in the first place? While it’s entirely possible that you have some kind of Gnome Fight Club going on in your attic, it’s more likely that the hairline ceiling cracks are caused by other means. Water damage can cause ceiling texture to crack and peel. If you have a leaky roof, you may develop this problem. Make sure you address the cause of the water damage before getting your cracks fixed. Concrete condo ceilings can also develop small cracks. In the curing process, concrete can sometimes crack. The age of the building can also be a factor in the forming of ceiling cracks. It’s common for older buildings to develop some cracks as they age. Water can cause concrete ceilings to crack, too. If an upstairs neighbour has a flood, water can find its way down into your unit. Again, as long as the cracks are not wide and structural, they are fairly simple to fix by an experienced professional. RemoveCeilingTexture.com is familiar with peeling and cracked ceiling texture. While they won’t cause your ceiling to collapse, spiderweb ceiling cracks definitely don’t add anything to your home decor. So unless you’re going for an earthquake-chic look, have them fixed. At RemoveCeilingTexture.com, we create beautifully smooth ceilings by removing ceiling texture, repairing ceiling cracks, and refinishing the entire surface. Contact us today for a FREE, no obligation quote. Call us at 604-420-7578 or send us an email. Ceiling cracks driving you crazy? Contact us today for a FREE quote on ceiling repair!